One of the most difficult things about coin collecting is grading them. Coin grading is a numeric system that rates from 1 (Hardly recognizable) to 70 (Perfect). Circulated coins or coins you would normally find in change grade from 1 to 58 where coins from US mint or proof sets grade from 60 to 70. This is one aspect I would like to learn and assist others with as we continue through our collective journey. I don’t send my coins to a grading service. So, like you, I have to figure it out for myself or get a second opinion from a friend or dealer. It’s very important to know what grade your coins have. 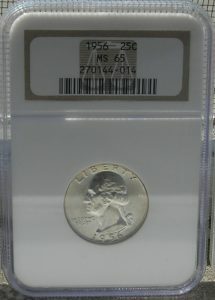 For example, determining whether your coin is graded 64 or 65 could change the value of it significantly. AG-3 (About Good) Details are pretty much flat. All that can be seen are outlines. Rims are completely worn. G-4 (Good) Coin is very worn. Very little detail. Dates barely noticeable. F-12 (Fine) Coin has medium wear. Some detail still worn. VF-20 (Very Fine) Medium to light wear. Most details appear. XF-40 (Extremely Fine) Light wear. Some mint luster. AU-50 (About Uncirculated) Highest grade for circulated coins. Great detail and luster. If anyone has tips on grading, please add them here.